Basingstoke and Deane Borough Council currently employs approximately 600 staff offering a vast range of employment opportunities in various different areas of work. We offer a selection of benefits to our staff. Take a look below at some of the benefits that you can expect from working for us. For a full list of benefits, please take a look at the my benefits section. What skills does the council look for in its staff? We offer new ways of working to meet the demands of employees who want to achieve a better balance between their work and their other priorities (including caring for children or elderly parents, gaining further education and qualifications or pursuing leisure activities). We employ both full and part-time staff. We also have flexible working hours, which allow us to provide the best customer service possible. Full-time staff are entitled to 22 days' annual leave, which then rises to 27 days after five years' continuous service in local government, (this is exclusive of eight bank holidays per year). The annual leave year runs from 1 April to 31 March. Part-time staff receive a pro-rata amount of annual leave and statutory days. All of our jobs are given a grade which corresponds to the pay scales shown in the document at the bottom of this page. If you are interested in applying for one of our jobs the grade will be clearly marked on the job advert and the job description. We are all aware of how important it is to save for our retirement. All permanent and employed temporary staff aged between 16 and 75 are automatically entered into the Local Government Pension Scheme (LGPS). The pension scheme is administered by Hampshire County Council (HCC). For further information on the scheme, please visit HCC's webpages. The LGPS is changing from 1 April 2014. If you are paying into the scheme then you will automatically be put into the new scheme from this date. If you retire or leave before this date, then there is no change to your pension including any deferred (frozen) benefits you have. For more information visit the dedicated member LGPS 2014 website. 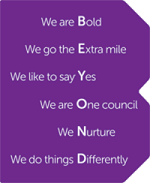 Everyone who works for the council takes part in an appraisal process which is an on-going cycle of review, planning, development and evaluation. It is an opportunity for a two-way conversation between staff and their manager to take an overall look at performance, work content, skills and competencies required to be effective within a job role, to look back on what has been achieved, and to agree objectives, training and development for the next year. Some knowledge of local government. Willingness to provide a service to the public. We expect our leaders and managers to role model our 'going beyond' vision and values, through their behaviours with our staff and our customers, to set a great example to others by doing so. We have set this out in our Leadership and Management Behaviour Framework.